How are we going to succeed? It’s a hard-core strategy question every organization faces. You can answer it yourself, but shouldn’t your customers? Your ability to collect and act on customer feedback will determine if you outperform your competition or polish the brass on the sinking Titanic. If your customer insight is out of shape, your strategy and execution will lack the muscle it needs to achieve your desired results. Strategy lacking true customer insight is the equivalent of a body builder entering a competition without ever setting foot into a gym. Customer insight isn’t just used for the creation of strategy. It’s the essential protein behind building strength in your execution. Constant and continuous flow of customer feedback lets you know what’s working and what’s not. Sales Team Feedback: Your sales team speaks directly with customers on a daily basis. Usually, they have a pretty solid idea of what your customers are looking for, asking about, or what makes them purchase. It’s an obvious choice to gather insight from the team of people interacting with your customers on a daily basis. Big Data: We live in the age of big data. Even if you’re a small company, you need to be using the tools available to collect and review customer activity. Tools like Google Analytics and Wistia give you direct insight into online customer behavior. Use them. 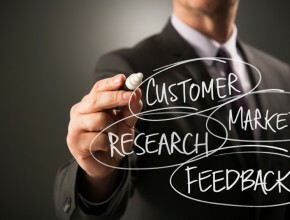 Customer Focus Groups: Conducting focus groups is always a good way to receive feedback directly from customers. They’re difficult to set up and don’t always provide consistent results. However, you can mine gold from them. Social Media: Social media has emerged as an efficient and effective way to collect customer feedback. Want to know how a customer is feeling about something? Literally just ask them. The social media culture has fostered an environment where customers really aren’t afraid to let you know how they feel. We often find ourselves back at a common question – Where do we play and how do we win? You can create the most ideal, wonderful strategy to answer that question. But it’s gutless and weak unless you truly understand what your customer wants or needs from you. Customer feedback is no easy road, but travel it and you will outperform your competition. Erica Olsen is the COO and a co-founder of OnStrategy. She has developed the format and the user interface for the award-winning OnStrategy on-line strategic management system. In addition, she is the author of Strategic Planning Kit for Dummies, 2nd Edition. Erica has developed and reviewed hundreds of strategic plans for public and private entities across the country and around the world. She is a lecturer at University of Nevada Reno and University of Phoenix. She holds a BA in Communications and an MBA in International Management. What is 14 + 11 ?